It is easy for most people to notice when a loved one is slipping, such as in their declining care in appearance, personal hygiene, home organization, etc. For the long-distance caregiver, these little hints suggesting a need for assistance are harder to detect. Many times a visit can be emotionally charged and consist only of spending the limited, quality time together. It is essential, however, for a long-distance caregiver to be practical and take care of the caregiving “business” while visiting, to establish support for after they’re gone. In this article, learn how to make the most of visits, see the warning signs, and rely on “substitute” eyes and ears while away from an aging loved one. While visiting a loved one, caregivers should arrive prepared to take care of bills, and other standard tasks. In addition, they must take time to meet with their loved one’s health providers, such as physicians, specialists, etc. Lawyers, financial professionals are also good resources for family members. They may have noticed irrational requests/behaviors from their client which can be relayed to the caregiver. Caregivers should not forget to have talks with local friends and family who see their loved one on a regular basis. All such conversations are critical to establishing any changes in a person’s behavior. These people are on the front line and the best resources for a long-distance caregiver. While relying on others is important, seeing changes firsthand will confirm and validate for a caregiver if a loved one is in need of more assistance. The old saying is “absence makes the heart grow fonder” and while that is usually true, for long-distance caregivers, absence can also make the eyes and ears grow keener. Subtle changes are usually more pronounced when a person is not with the other on a daily basis. What is the condition of the inside and outside of the home? Has it changed? What is the person’s appearance like? Is the person bathing and grooming? Weight loss is one of the most prominent signs of distress, both emotional and physical, in an elderly loved one. This can stem from a serious illness such as heart failure, dementia or depression. On the other hand, it could signal a lack of energy to cook, even difficulty reading directions or washing dishes after a meal. Medications change the way food tastes, so the person just may be challenged to find something that tastes good to them, and is familiar enough to make without extra effort. Parentgiving.com also says to monitor the person’s balance. How they walk, bend, and simply move around can say a lot. Maybe they are experiencing pain, limping or wincing with movement. If unsteady on their feet, this behavior can be a real risk for falls, which leads to more severe complications. Elderly people have a progressive loss of bone mass, making falls serious risks. Stairs become dangerous, as do yards, icy walkways, tile or laminate floors and even wet bathrooms. Though technology has improved the ability for people to communicate, face-to-face interaction is still necessary, especially for a long-distance caregiver. Body language, emotional well-being, and other physical traits cannot be discerned through a phone or computer connection. The same can be said for maintenance, whether of a home or personal appearance. 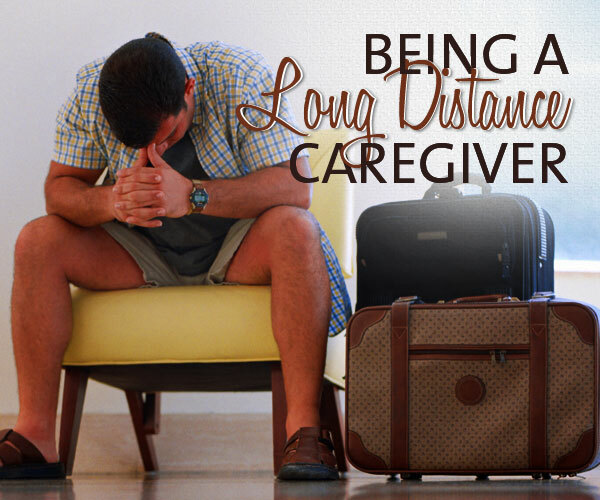 Long-distance caregivers must be attuned to any changes, small or large, with their loved one. If a person was always a “neat freak” and is suddenly letting magazines pile up, cleaning go undone, it may be a call for help. Check hampers, dishwashers, garbage bins, dates on prescription bottles, and even checkbook ledgers, to ensure basic cares are being performed. If there is concern, it may be time to enlist assistance. Burns or injury marks: suggests problems involving general weakness, forgetfulness, or a possible misuse of alcohol. Increased car accidents: shows slowed reflexes, poor vision, physical weakness, or general inability to handle a vehicle. General forgetfulness: including not paying bills, missing appointments, or consistently forgetting name, address, phone number, and meal times. Extreme suspiciousness: indicates some thought disorder. An example of this is a loved one thinking that their neighbors, friends, family, doctor, and lawyer are all conspiring against them. A series of small fires: may be from dozing off, forgetting to turn off the stove or appliances, or carelessness with matches. This trend indicates blackouts or dizzy spells. Bizarre behavior: includes things such as dressing in heavy gloves and overcoat in 90-degree weather or going outside without shoes when it’s snowing. Disorientation: examples include not knowing who one is, where one is, who the family is, or talking to people who are not there. There are many warning signs a caregiver should be looking for. Some are more noticeable than others, and aging loved ones also are very good at “hiding” changes, in order to protect and avoid burdening their family members. Caregivers need to provide quality care, but be good detectives as well. Taking an assessment of a loved one’s needs can help a caregiver determine the support required. This list offers a place to start, and items can be added which pertain to each individual. Help with chores, laundry, yard work, and household maintenance? Meals delivered to the home or fixed and served there, with clean-up included? Help getting dressed or bathing? Transportation to important places, such as religious or social gatherings, the pharmacy, or doctors’ appointments? Assistance with medical appointments, and/or consultation with doctors and other health professionals? Assistance paying the bills, banking, budgeting, or other money matters such as looking into financial assistance to make ends meet? An attorney experienced in elderlaw issues? Dispensing of medications and ensuring they are taken on time? Once the level of care is determined, it’s time to discuss findings with other family, if applicable, and also the aging loved one. Before any permanent changes are made, it is imperative a caregiver sit down with their loved one and discuss the circumstances. Emotions may be running high and play a factor in how the suggestion to seek help is perceived. Tread lightly! The U.S. Department of State offers these tips for having this conversation with a loved one in a foreign service family, but the advice spreads across the board, to all caregivers. First, the department says it’s important for caregivers to share their own feelings, reassuring the family member they will be shown unconditional support and love. They must also help their loved one retain as much independence as possible. It is important the family member is encouraged to make his or her own decisions. At the end of the day, it is still their life and in the parameters of safety, caregivers need to respect and honor their loved one’s wishes. A positive attitude will keep spirits high and show a loved one that changes are in their best interest, to help them continue leading a full and happy life. A caregiver should ask a loved one what is most important to them, and ask for ways they may have thought of to seek assistance. At each step of the way, the Department of State says to encourage the smallest change first, and not take drastic measures unless necessary. This allows the loved one to adjust easier and prepare for additional assistance in the future. The long-distance caregiver must be educated on the legal, financial and medical matters of their loved one. This conversation is a good time to be granted permission and soon after, secure access from advisors and medical providers. Last, a caregiver must respect their own needs. Honesty will go a long way to an open and caring relationship. Everyone has time and energy limits. Change is difficult, even for those who are younger. Change for seniors is an altogether different mountain to climb. Many people have been in the same home for decades, raising a family, watching them move and then settling into the retirement routines. For a long-distance caregiver, finding local resources is a key factor to a successful transition for a loved one and themselves. Today, aging in place is a desired path for many elderly people and their caregivers. This simply means that resources are brought to the person, at their home, for as long as it is safe to remain there. Geriatric care managers and many other professionals are finding a business niche in this segment of the population. They are available to gather resources, determine which are best suited for the client and implement them. The home service sector has boomed to facilitate the aging-in-place population. Assistance in the basic cares of cleaning, cooking and laundry, to full nursing care is available in-home. A caregiver should start with the list they compiled through observation and pursue help from there. Taken step-by-step, the process of introducing some assistance to a loved one can be a smooth process. Long-distance caregivers don’t have to go it alone and can make the most of their visits by assessing any changes in their loved one, then seeking out appropriate resources. It then makes the visits more focused on time together, and less on worrying about a loved one’s safety and care.